LEXINGTON, Ky. (Jan. 29, 2019) — University of Kentucky classes are canceled for Wednesday, Jan. 30, 2019, because of anticipated severely cold temperatures. A UK Alert and a message from UK Executive Vice President for Finance and Administration Eric Monday were distributed to the campus community Tuesday evening. UK HealthCare hospitals and clinics will be open and operating on a normal schedule Wednesday. Classes and business operations for the University of Kentucky campus will be closed Wednesday, Jan. 30, 2019. We are on Plan B for emergency closure due to weather. That means only designated employees show up for work. For details about that status, you go to this site for more information: https://www.uky.edu/see/severe-weather-procedures. For more information, please go to www.uky.edu/alerts. Current predictions are for bitterly cold temperatures and dangerous wind chill levels that are expected to last throughout much of the day tomorrow. Such conditions significantly increase the potential for frostbite with even limited exposure. UK HealthCare – the hospitals and clinics – will remain on normal operating schedules. Most of UK’s dining facilities, the Gatton Student Center as well as the Johnson Center and Alumni Gym fitness centers also will be open. 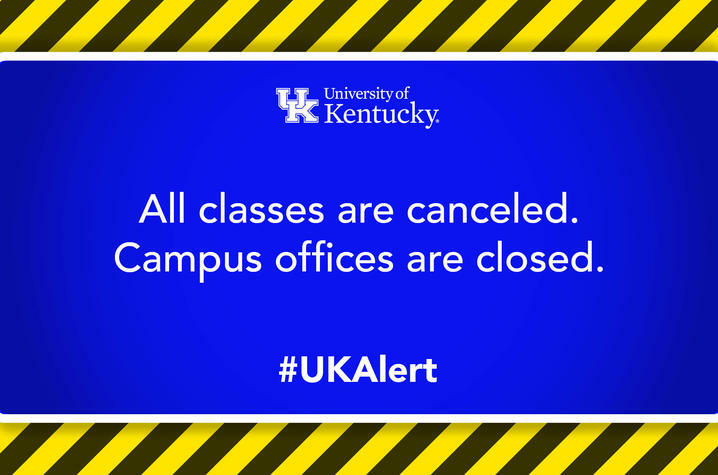 A complete list of what is open – and hours of operation – can be accessed here: www.uky.edu/alerts. We will update that list, if and when operating hours for facilities change or need to be adjusted. UK Libraries, including W.T. Young Library, will be closed Wednesday. We anticipate classes and operations returning to normal schedules on Thursday, Jan. 31. Even though cold temperatures will persist, wind chill levels are currently predicted to lessen, lowering the risk of exposure. We will communicate as quickly as possible the status of UK operations on Thursday. Because of tomorrow’s expected weather conditions, we urge those of you who can to stay inside. These websites — https://www.cdc.gov/niosh/docs/2010-115/pdfs/2010-115.pdf and https://www.weather.gov/safety/cold-during — discuss the types of weather conditions our community will face tomorrow and contain tips for how to dress as well as signs of frostbite and related issues. Your health and your safety are our top priorities at the University of Kentucky. Please take care of yourself and those around you. All of you are special members of this community. Be safe. Gatton Student Center will operate on normal schedule from 6 a.m. to midnight. Alumni Gym and Johnson Center will operate from noon to 5 p.m.; Lancaster Aquatics Center will operate from 11 a.m. to 1 p.m.
Transportation – campus bus routes will operate; parking lots will be in off-peak patrol status. Fresh Food Company: open 7 a.m. - 10 p.m.
Papa Johns @ The 90: open 11 a.m. - 8 p.m.
Wildcat Pantry @ The 90: open 11 a.m. - 8 p.m.
Starbucks in WTY Library: open 9 a.m. - 8 p.m.
Chick-fil-A: open 9 a.m. - 8 p.m.
Champion's Kitchen: open 7 a.m. - 10 p.m.
Wildcat Pantry (Steak n Shake): open 11 a.m. - 8 p.m.
Other dining facilities and UK Libraries, including W.T. Young Library, will be closed Wednesday. MoveWell at Export and Seaton are closed Wednesday, Jan. 30, 2019. No group fitness classes on Wednesday, Jan. 30, 2019. Members may use the Johnson Center/Alumni Gym from noon - 5 p.m. by showing your photo ID at the front desk.